Holistic education requires that the boundaries of learning stretch beyond the apparent, indulging students in a more riveting, resourceful form of education. The current education system with all its reforms and technologies, widely advocates this ideology, encouraging higher-order thinking in students. The concept of Higher-Order Thinking Skills (popularly abbreviated as HOTS) propagates the idea that learning should not be merely limited to receiving information, memorizing it and putting it out there as is. It requires students to dig deeper into the information received, and understand, dissect, categorize, analyze, connect and apply the same. Higher order thinking facilitates cognitive and critical thinking, and encourages students to learn while using their own judgment and making their own choices. Curation is rapidly standing out as an effective strategy to teach higher order thinking in students. Curation is the collection and organization of ideas and resources from across different sources, identifying common, useful traits among them, suited to best suit the issue/need at hand. Curation goes far beyond its traditional meaning of collection, into the realms of the core. Students are expected to gather, condense, analyze and present information into comprehensive, captious content. How Does Curation Differ From Collection? Curation and collection both require students to gather information. However, curation goes a step ahead, requiring them to use critical and cognitive thinking. Collection may be mistaken for dumping of ideas, whereas curation is the collection, organization, analysis and application of ideas. Curation stimulates higher order thinking, by making students dig deeper into the collection of data, finding ways to not just apply it in current scenarios, but also retain and remember it for further application in real life, any time in the future. Collection ends with gathering information, whereas curation begins with it. 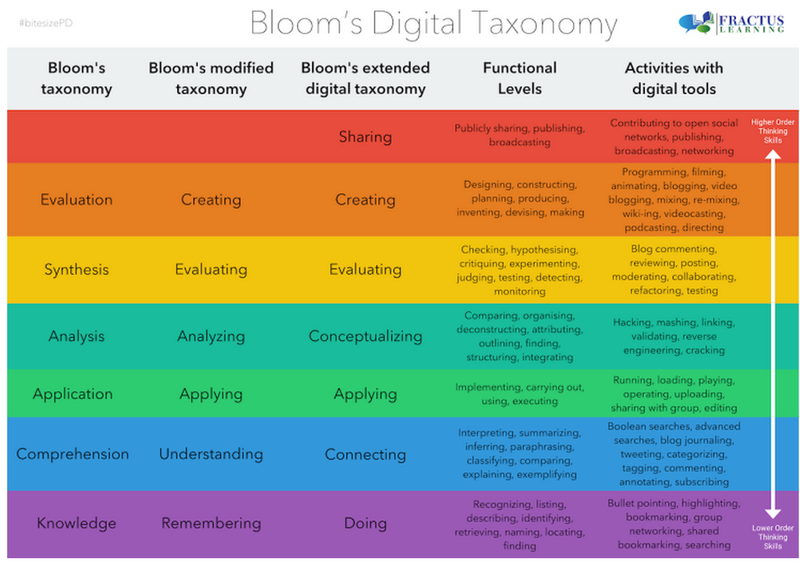 A revised taxonomy for teaching, learning, and assessment was published in 2001, with cognitive concepts such as remembering, understanding, application, analyzing, evaluation and creation. Curation covers the following three important levels in the taxonomy, eventually leading to creation. Understand: Curation requires students to understand the information collected, and its relevance to the requirement. Understanding is a key requirement to be able to filter data. They then classify, describe, discuss, explain, identify, locate, report, select and translate the data. Apply: Once understood, the data needs to applied in relevant situations. Curation empowers students with enough understanding, to be able to apply the knowledge in different situations – at school or outside. Here in lie the stages of execution, implementation, demonstration, interpretation etc. Analyze: An important aspect of curation is to enable students analyze information, and find correlation among ideas and concepts. This stage may include differentiation, distinguishing, comparison, organization, questioning, testing and analysis. Creation: Creating an amalgamated content with just the right information, after thorough analysis and contribution. Adding comments, or accompanying thought pieces or inputs with curation, pushes students another level further, requiring them to be cognizant and creative. Basic curation requires students to select a topic, find articles, videos, images, links, documents etc., to create a final product that analyzes content and draws ideas and common knowledge from all resources curated. Here are a few more methods beyond physical and digital curation that promote higher order thinking in students. Digital exhibitions: Students are required to make presentations with digital media, adding content aligning with the resources. Ranking: Ranking is a popular method of curation. It requires students to collect relevant data, analyze and rank them according to set criteria. Shared traits: Students must collect resources spanning different subjects, focus areas and topics, to bind them with common traits that are not apparent, yet vivid. Research review: Students get to take ownership of their learning, by researching a particular topic, and presenting their own understanding from the research. Real examples: Students must to keep an eye on different real life scenarios, case studies, examples and instances, where a subject is visible/utilized/applied in real life. Books: Accessing different books irrespective of genre, authors, publishers, to curate content that find common ground. Projects: Indulge students in projects that are end products of curation, to help gain a deeper understanding of the subject, while giving a practical exposure to the same. Curation is a fine amalgamation of information with analysis and creativity, promoting high order thinking among students, not just empowering them with the ownership of, and aid to, their learning, but also exposing them to vast resources of information, that they eventually learn to filter and select from, both for educational and practical purposes.